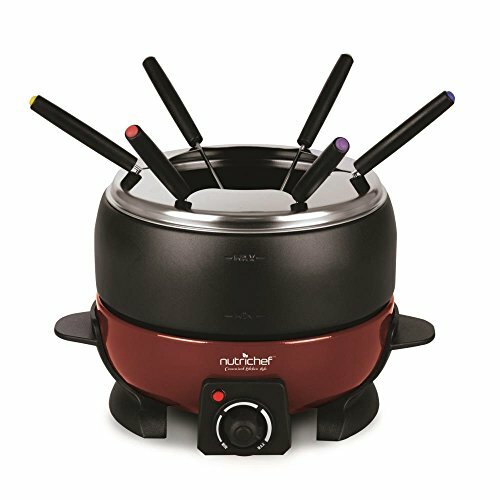 If you love getting groups of your friends or families together and having a good time, then NutriChef’s Electric Fondue Maker would be a great addition to your kitchen. It can make your dining experience a night of fun and its perfect for serving large groups too. It features a heated electric base to melt cheese, chocolate or more right in the pot. It comes with six color-coded fondue forks to avoid confusion of which fork belongs to whom. NutriChef’s Electric Fondue Maker also comes with a handy feature of an adjustable temperature control knob to adjust the heat and prevent scalding or burning your fondue. FUN DINING EXPERIENCE: Perfect for serving large groups, the electric fondue set comes with six color-coded fondue forks for guests. COMPACT & CONVENIENT: Cool to the touch handles & adjustable rotary temperature control makes serving & cooking easier. Cooking capacity is over two quarts, includes a removable serving bowl. COUNTERTOP SAFE: The fondue pot is non-stick & heat-resistant. It is safe to place on any kitchen table or countertop. Move it to best placement for entertaining & large parties. MELT CHEESE & CHOCOLATE: Just like your favorites restaurants the melting pot cooker features a heated electric base to melt both cheese & chocolate. Great for dipping bread, vegetables, marshmallows, fruit & more! EASY TO CLEAN: The electric fondue set contains a removable Teflon bowl & a non-stick surface for easier post-dinner cleanup.